Discover the Excitement and Diversity of African Wildlife! Over 120 specimens representing more than 70 species are on display, including 42 species of birds and 28 species of mammals. Many rare and endangered species are showcased, including Okapi, Lowland Gorilla, Mandrill and Scimitar-horned Oryx. 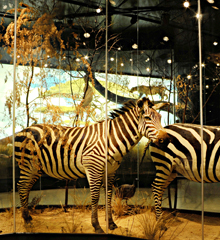 Additionally, many species rarely seen in museums are on display here, including Gerenuk, Giant Forest Hog, Guenons and other forest primates, and a variety of birds. The natural panoramas containing family groups of Aoudad sheep, Scimitar-horned Oryx, Greater Kudu, Rock Hyrax, Spotted Hyaena, Egyptian Goose and Great Blue Turaco are a special treat for visitors of all ages.